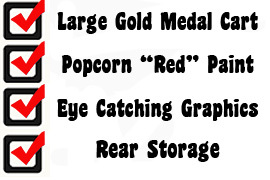 Gold Medal's 2214 Red Top 12oz/14oz popcorn machine offers a small footprint than most large poppers. This will safe on precious counter space and still offer great tasting popcorn at an affordable price. 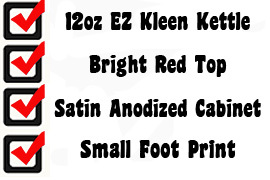 The 12/14oz EZ Kleen kettle will pop up to 250-1oz servings per hour and the heated popcorn deck will keep the fresh popped popcorn warm. 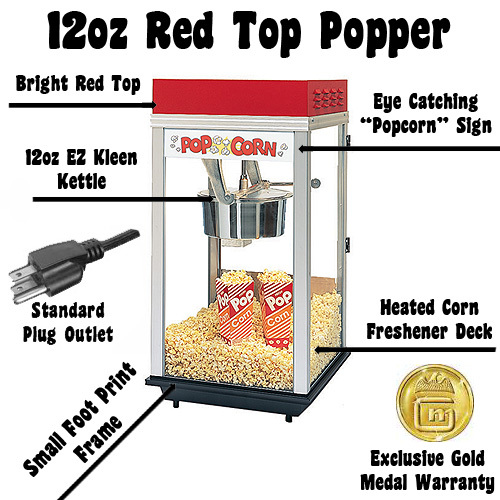 The heavy duty aluminum cabinet, heated corn freshener deck, and twin rocker arms, make the Gold Medal Red Top 2214 a super great popcorn machine choice. Why wait? order yours today! Due to truck shipping with this item, please call in your order for best shipping cost.